A cassette can take a lot of miles. But how many depends on how much care you give your chain. There’s this myth that when you replace your chain, you should also replace your cassette. That’s only true if you’ve really worn your chain out. The pins that connect the chain links wear over time, causing your chain to get longer. After a while, the shifting gets sloppy and inefficient and the chain starts to deform the cassette cogs and the chainrings. The trick is to replace the chain before it gets too worn. 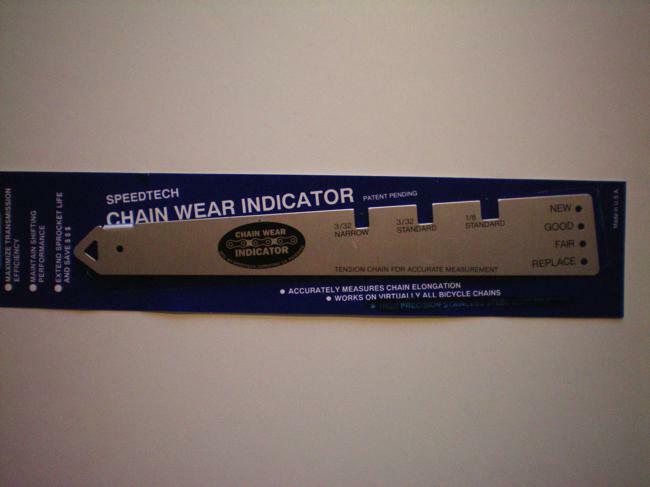 You can purchase an inexpensive chain gauge which lets you check the wear of the chain. 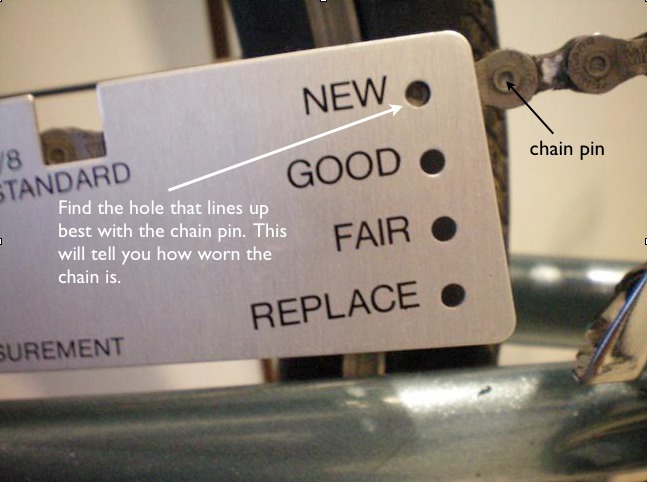 By replacing the chain before it reaches the “replace” point, you can continue to use the same cassette. Everything is expensive these days, but replacing just the chain is a lot less expensive than replacing the chain and the cassette. So, the name of the game is to keep that chain going for as long as you can. That means cleaning it and lubricating it properly. The rider who sent in this question admitted to riding in the rain a lot and not paying much attention to her chain. Both the worn bicycle chain and the worn cassette died an early death. I’ve ridden the same cassette over 10,000 miles by caring for the chain and replacing it twice. Note: The chain gauge shown here is no longer made. 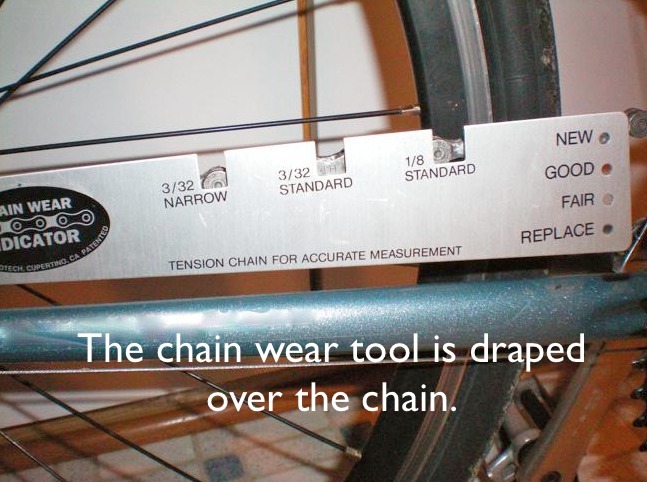 But check out Park Tool’s CC-3.2 Chain Wear Indicator. It’s inexpensive and works well. Lugged Frame or TIG-ed frame? By default, the bicycles shown on my site are TIG welded. Even though you may see this kind of construction almost exclusively these days on both steel and aluminum frames, you may not have know what it’s called. Here’s a photo of a Coto Doñana Vagabond showing a TIG joint — seat tube, top tube and seat stays. But another way of “putting the tubes together” is with lugs. 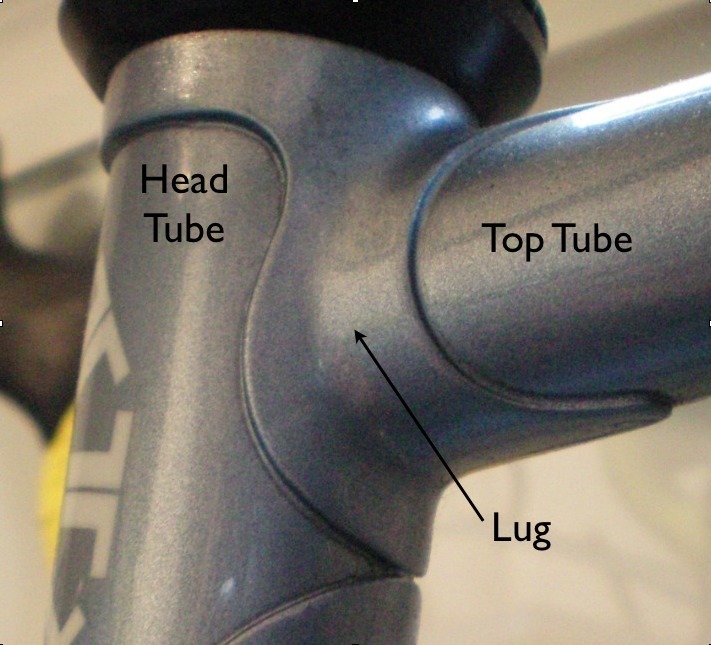 Lugs are sleeves that hold the tubes in place. 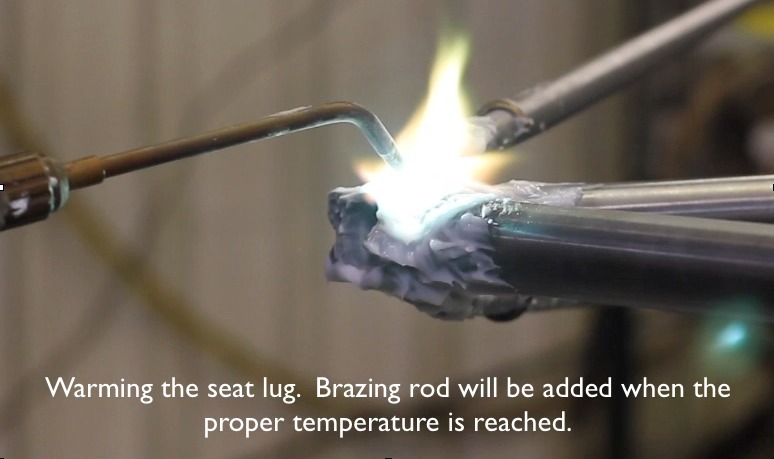 Brazing rod is melted into the sleeve and becomes a very strong “glue” that holds everything together. Is one method better than the other? It just depends on your preferences. Aesthetically, a lugged frame looks classy and elegant. 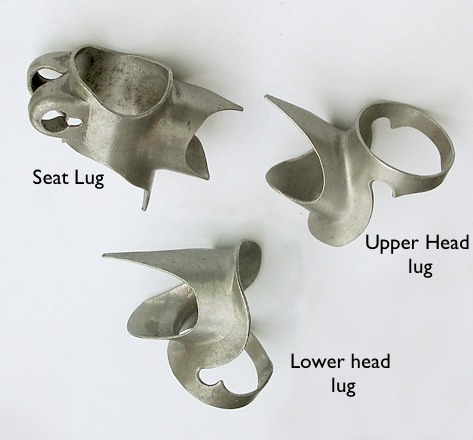 With some creative filing and cut outs, lugs can become works of art. If you’re thinking about purchasing one of my bikes and want lugs, I’ll be glad to oblige. They are well worth the extra cost. Structurally, either method is fine. 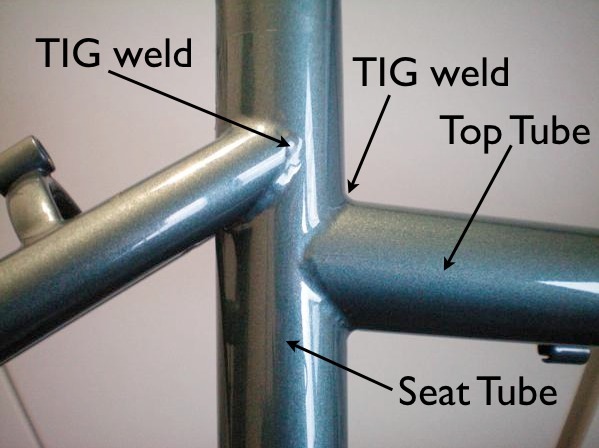 Typically, a TIG-ed frame will weigh a little less because it has no lugs. In theory, the “butts” (more wall thickness at the end than the middle of the tube) can be a little bit shorter since heat from TIG welding is more localized. 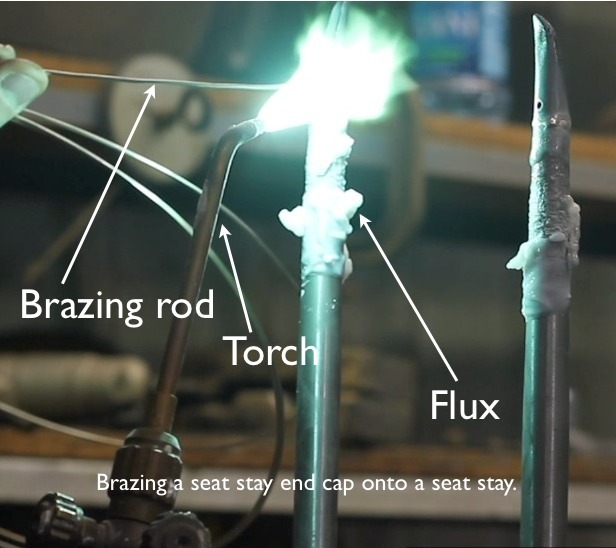 With a brazed, lugged frame, the heat spreads over a greater length of the tubing, so the butts may be longer. Longer butts add weight. Lugs typically come in set angles, so this may an issue if the frame design calls for something unusual. Since TIG-ed frames don’t use lugs, any frame angles will work. In an upcoming post, I’ll talk about the “miracle” of lugs, tubing and brazing rod.